Drop Zones are design magic, giving you the power to create custom designs in a matter of seconds. 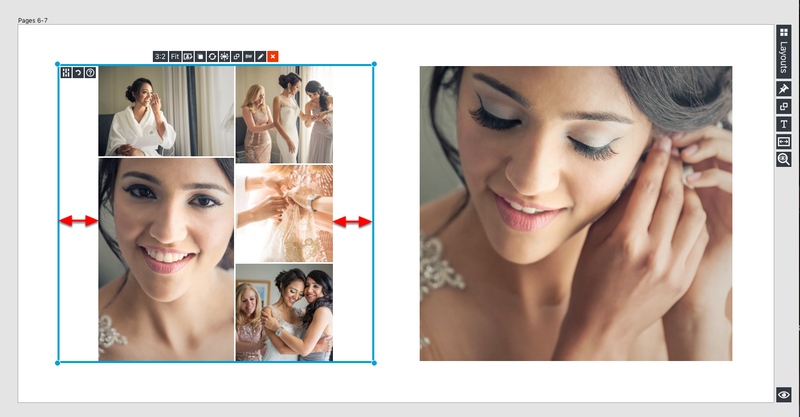 Just drag and drop your images onto a spread and they are automatically placed into a Drop Zone. Grab the corner of your Drop Zone, move it around and watch the design automatically adapt. Whether it’s adding new images to a Drop Zone, or moving images around within a Drop Zone, you'll experience creative freedom when designing your spreads. As shown in the image above, the images placed on the spread are enclosed in a blue box, this is the Drop Zone for this particular design. 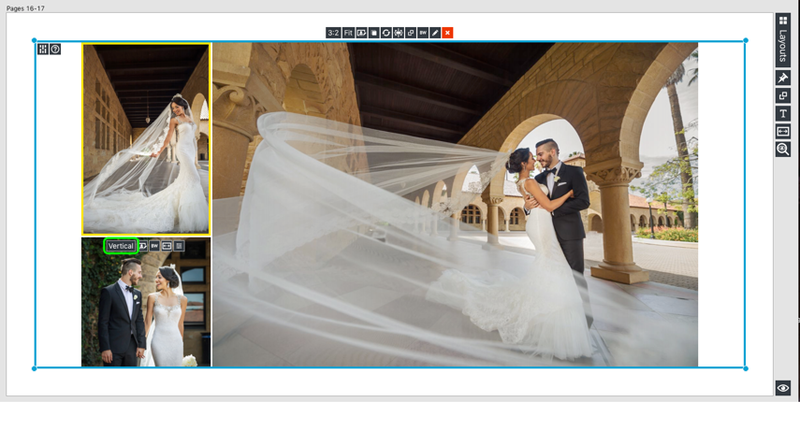 Moving images around is extremely simple and intuitive with the introduction of Drop Zones 2.0. 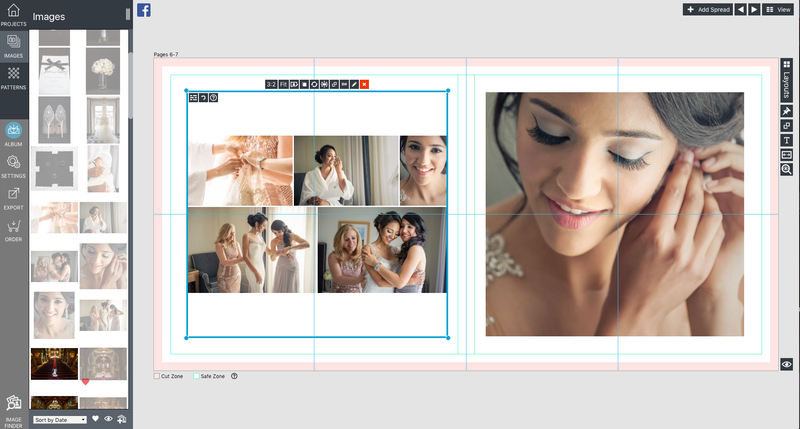 Experience creative freedom when designing your album spreads. 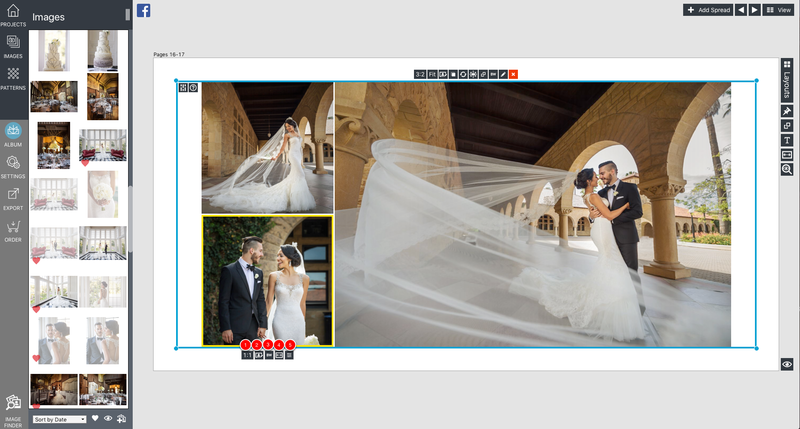 Add images by selecting a group of thumbnails and dragging them onto a spread to automatically create a Drop Zone or add images to an existing Drop Zone. You can move images within a Drop Zone by dragging them wherever you want. A yellow box will appear indicating where you can place the image. If you drag an image on top of another image, you can swap images. 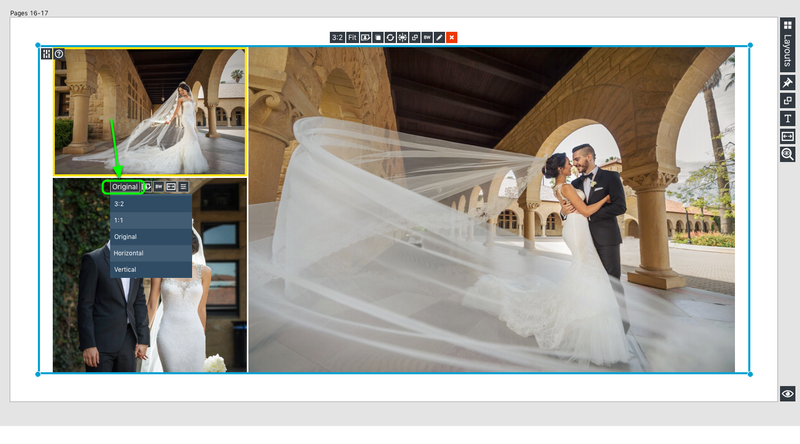 As you can see in this example, we moved the selected image between the two images below it. The design adapts to the new arrangement allowing the top images to be larger on the page and stand out more. 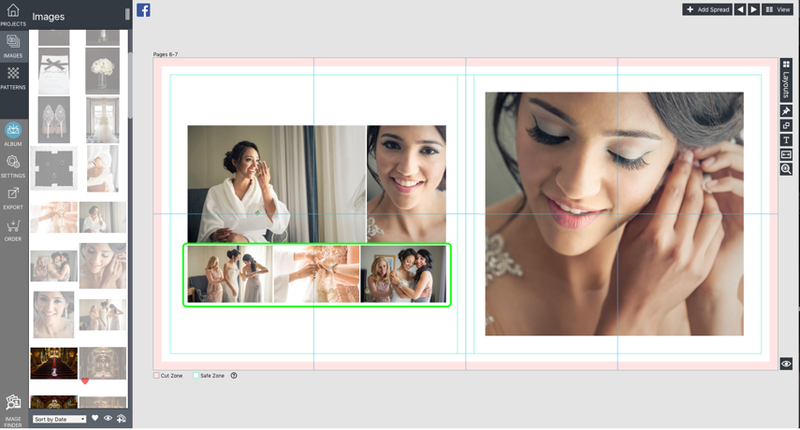 Sometimes you want the Drop Zone to align your images in columns or rows. We’ve made that easy with a brand new toggle. Above is the Drop Zone selected with the toggle set as rows. Above is the Drop Zone toggle set to rows. As you can see, the design concept was maintained and updated as columns. Once you toggle between columns and rows, a circle with an arrow will appear. This indicates that you have manually taken control of the Drop Zone. You can rescale the Drop Zone and the design will remain locked. If you want to go back to Auto Design within the Drop Zone, click the circle icon to reflow the Drop Zone with your images. 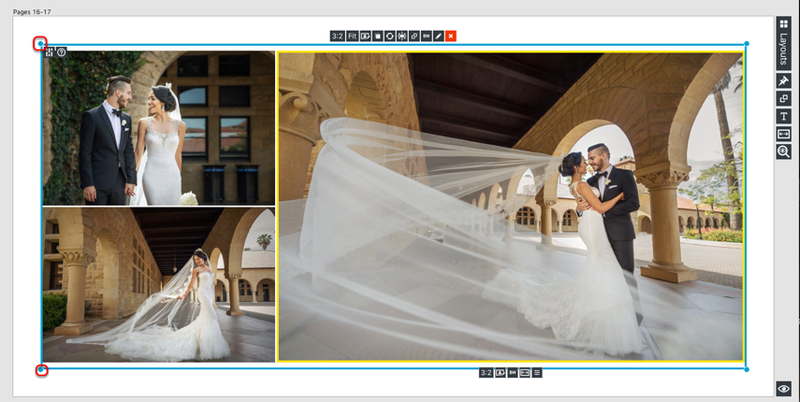 Adding a new rows or column of images is extremely easy too. 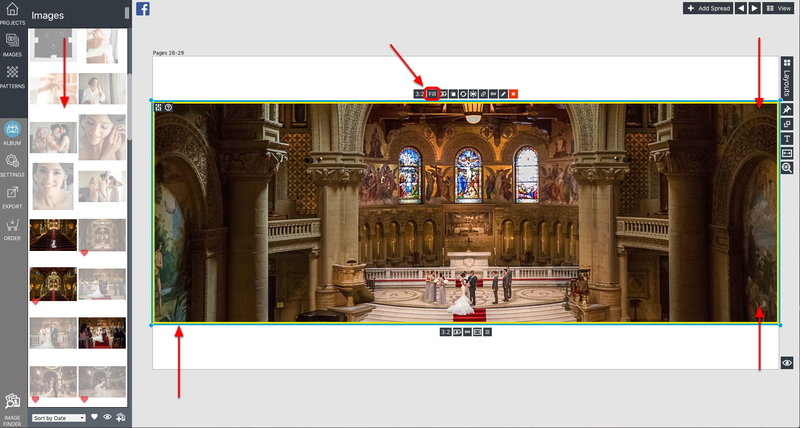 Drag an image onto the edge of a Drop Zone or between two rows or columns. 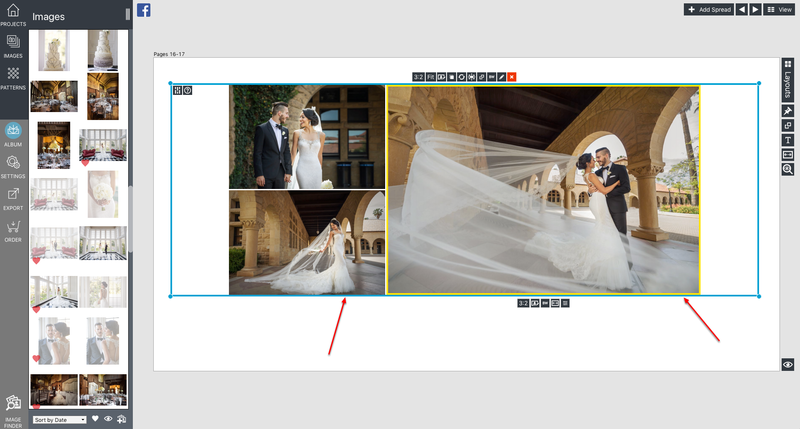 Here you can see that we are dragging an image to the edge of a column, which will create a new one. 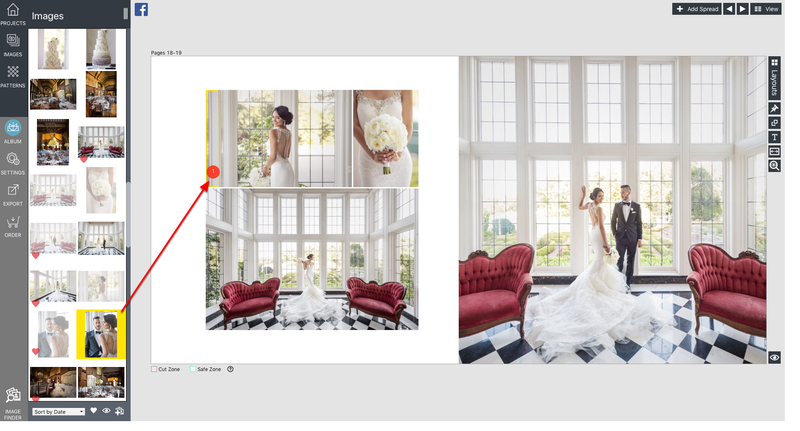 To add an image to a Drop Zone, drag your image(s) from the Image Well and drop it into an existing Drop Zone. The Drop Zone will dynamically adjust your design instantly. To delete an image from a Drop Zone, select the image and hit the Delete key on your keyboard or you can right-click the image and choose 'Remove Image' from the menu. The corners of the Drop Zone allow you to change the size. As you place your mouse over the corner, your cursor will turn into a double-ended arrow icon indicating the ability to scale is present. To maintain the aspect ratio while scaling the Drop Zone, hold the shift key while moving the corner. You can also choose to hold the Option/Alt key while resizing to maintain the aspect ratio while scaling the Drop Zone from the center. To move the Drop Zone around the spread, simply hover over one the blue edges of the Drop Zone. When your cursor changes to a hand icon, you can click and move it around the spread. At the top of your selected Drop Zone you'll find a toolbar with 10 different tools. 10. DELETE DROP ZONE: This simply allows you to delete the selected Drop Zone. You can override an image ratio. If you have a horizontal image, you can make it a vertical and vice versa. 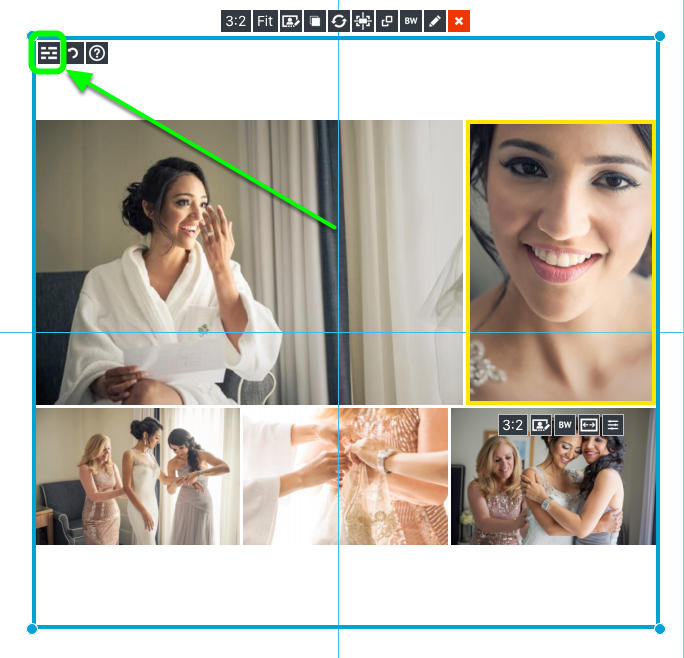 We can apply this to one image, or if we hold down the shift key, we can apply it to all images in that row or column. 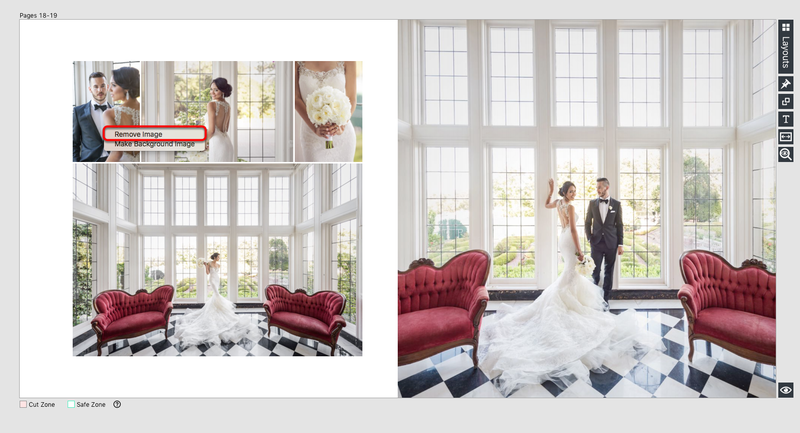 In this example, we'll select a single image in a Drop Zone and change the image ratio from Horizontal to Vertical. As you can see, when the image ratio was changed to Vertical, the design adapted, but kept the original design concept. Here is an example of holding down the shift key and selecting the 1:1 ratio. You can see that all of the images in that column of images changed to square and the design adjusted. You can add additional Drop Zones to a spread by selecting the image(s) and dragging them over to an empty space on the spread. *Please note that this will only work in Designer View. You can replace or swap images within a Drop Zone. 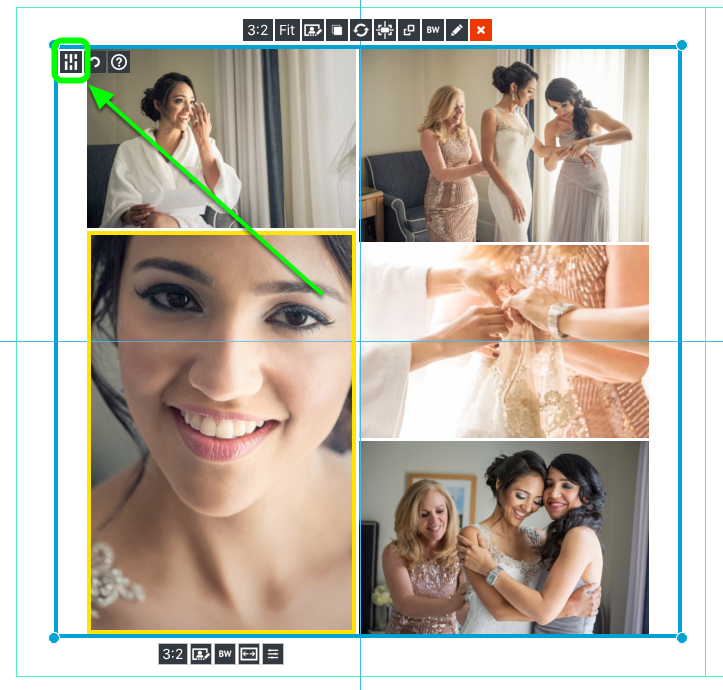 To do this, select the new image and drag it over the same spot as the image you would like to replace. Once the yellow selection box appears around the image, you are ready to drop the new image into that spot, replacing the original image. 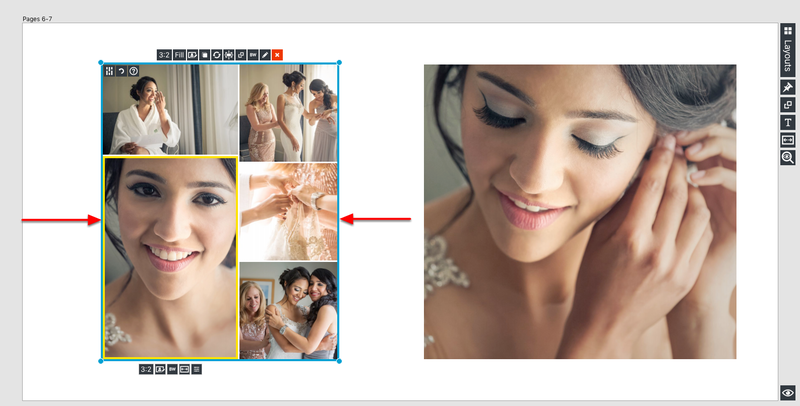 You can swap images within a Drop Zone or you can replace an image by dragging a new one from your image thumbnail well. 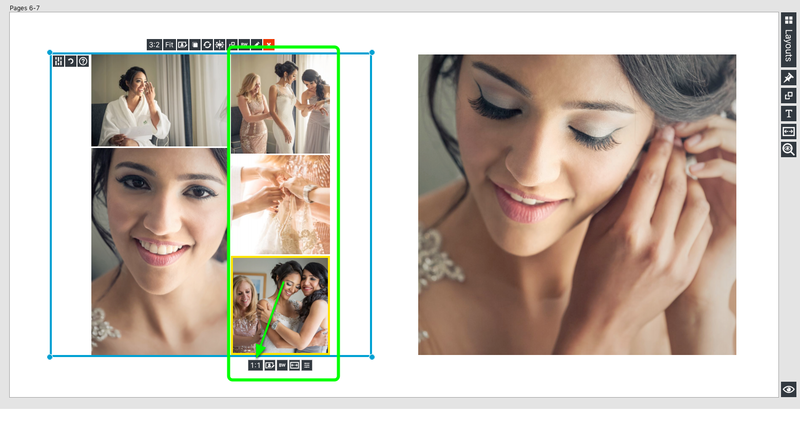 Drop Zones are automatically created when you drag your images onto a spread. 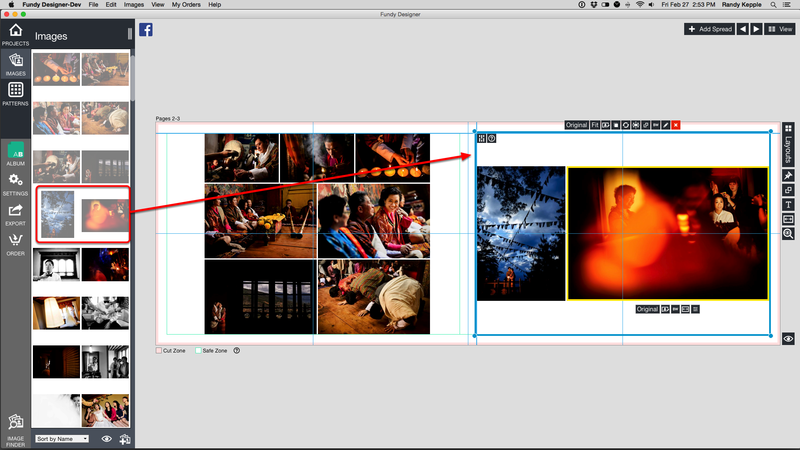 If you drag a group of images onto a spread, all of them will be placed into a single Drop Zone. If you have more than one Drop Zone on a spread, you can group them together. As you move a Drop Zone next to another one, it will automatically snap, respecting the spacing distance you have in your settings. Sometimes, if you have your Drop Zone set to Fit (keeping the original aspect ratio of your image) there will be a lot of empty space in the Drop Zone. 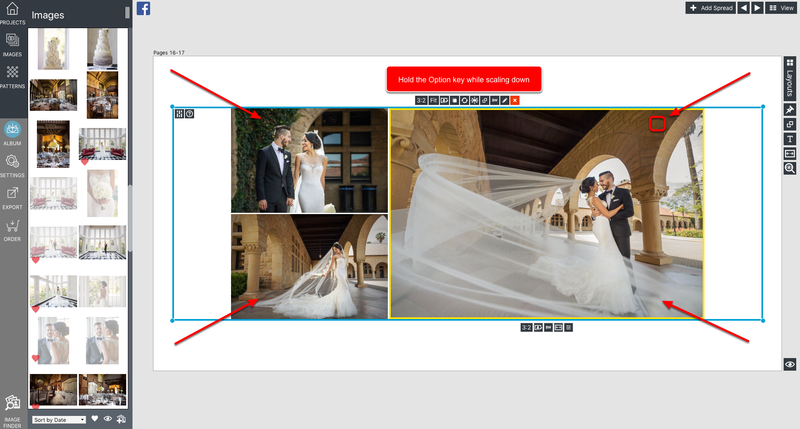 This can seemingly prevent you from placing your images next to each other if they are in separate Drop Zones. 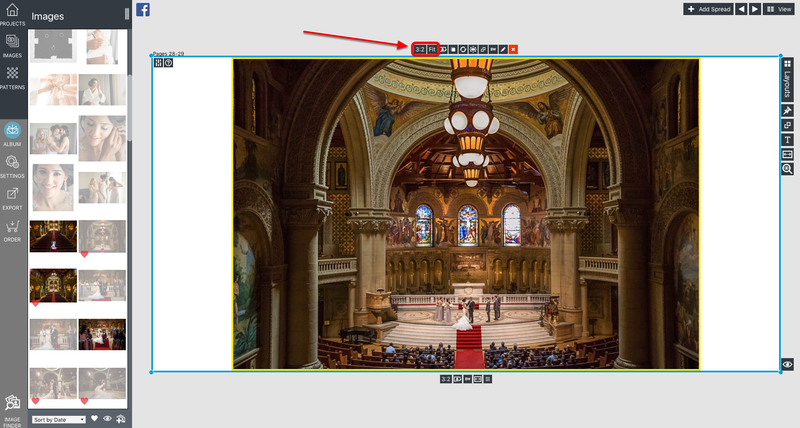 By double-clicking on the blue border of the Drop Zone, it will automatically collapse the Drop Zone to the edges of your image or group of images. Now you can move your Drop Zone closer to another Drop Zone or to the edges of your spread. 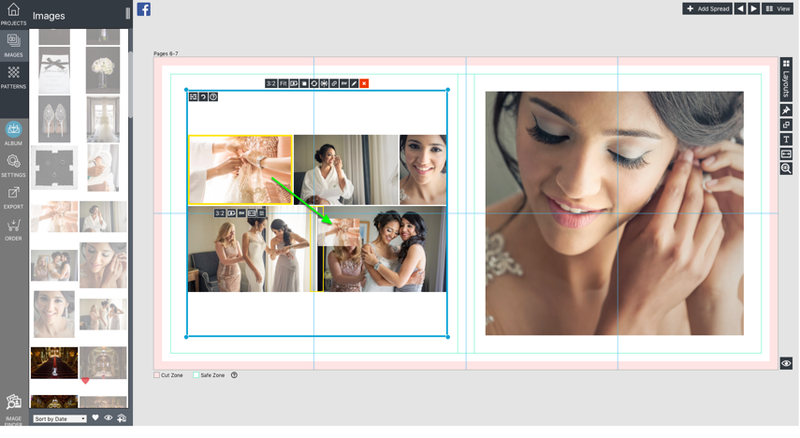 Creating panoramic images is very easy to do with Drop Zones. In this example, a single image is placed on the spread in it's own Drop Zone. By default, it's in it's original 3:2 proportion and the Drop Zone is set to Fit. This means that the image is filling the Drop Zone so that it fits, without changing it's original proportion. To create this panoramic image, the Drop Zone was changed to Fill (the image will completely fill the Drop Zone). 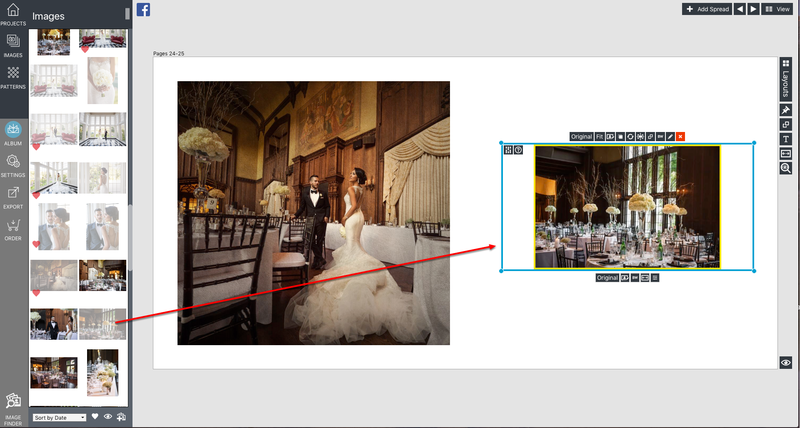 Next, drag the corners of the Drop Zone to change the height of the image. The Drop Zone will automatically snap to any of the guides on the spread. Once you are happy with the dimensions of your panoramic, you simply click and drag the photo to move it up and down within the Drop Zone until you are happy with the crop. You can see Drop Zones 2.0 in action HERE.